They did it. Not only did Penn Points qualify for the honor of being finalists in the national Pacemaker award, they were one of seven who actually won this recognition. The two seniors from Penn Manor who attended the conference, Abby Wilson and Alex Geiger, had the privilege to walk in front of the three thousand people in the main convention hall and receive two different awards. The first was a plaque stating that they were finalists in the Pacemaker award, honor enough for the Penn Points’ first year online. To complete their achievements their name was called as one of the winners, which brought their adviser, Susan Baldrige, truly to tears. The awards aren’t the only remarkable things that the staff is bringing back to Penn Manor. They are taking with them an abundance of fascinating information and brand new ideas to further improve their website and their journalism course. “Journalism is the Twenty-First Century English” curriculum,” Paul Kandell, adviser from the Palo Alto Paly Voice in California. By taking this trip across the country, the Penn Points staff is working toward making this statement a fact at Penn Manor. Well deserved honor…we are all proud of you! Congratulations to all who have made this endeavor a success! 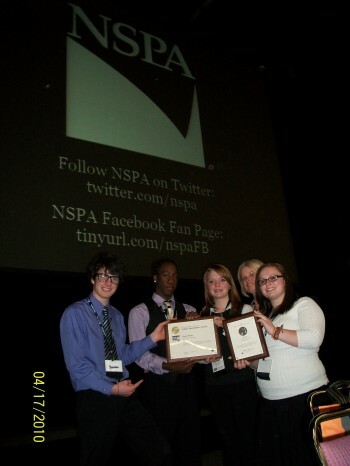 What an honor to have your hard work and dedication recognized nationally! Everyone enjoys reading Penn Points. Congratulations to the Penn Points Staff! You worked hard and you are very deserving of this award! We are proud of all of you! This is EXCELLENT news! Congratulations on a job well done!!!!!! Great Job Penn Points Staff! This is outstanding. We’re proud of the work you’ve done and positive attention you’ve earned for yourselves and PMHS. Wow! This is AWESOME!!!!! Great job! You have taken a step into the future with this online paper, and you have given Penn Manor positive recognition that it truly deserves! Congratulations to the entire newspaper staff.